KABUL (NYTIMES) - The bombing of a crowded religious gathering in Kabul on Tuesday (Nov 20) killed at least 50 people, Afghan officials said. Mr Wahid Majrooh, the spokesman for the Ministry of Public Health, said that in addition to those who were killed, at least 75 people were wounded in an explosion at the Uranus Wedding Palace, near Kabul's international airport, and that officials were still trying to determine the exact toll. He added that 24 of the wounded were in critical condition. Mr Najib Danish, the spokesman for the Interior Ministry, called it a suicide bombing and confirmed the death toll. Witnesses said there were a thousand people inside the hall when the explosion took place. They included clerics and religious scholars along with others who had gathered to celebrate the birthday of the Prophet Muhammad, a national holiday in Afghanistan. President Ashraf Ghani called the attack "a crime against Islam and humanity" and declared a national day of mourning on Wednesday. Mr Shamsul Dua, 50, an ice cream vendor, emerged from the hall with his hands, feet and clothing covered in blood. He said the explosion took place seven or eight minutes after the gathering began. "I could only see smoke and debris started falling from the ceiling," he said. "I personally saw 30 or 40 dead." He added that he had ridden 40 minutes on his bicycle to attend the gathering, which is held at the hall annually. It was 40 minutes before ambulances arrived to evacuate many of the wounded, he said. Ambulances were seen still coming and going from the wedding palace an hour after the blast, which took place at about 6.15pm. "We are still trying to figure how many were killed and how many were wounded," Mr Majrooh said. Mr Muhammad Hashim, 36, a survivor, said the blast occurred as verses from the Quran were being recited to begin the commemoration. "A lot of people were trampled as others were trying to flee," he said. "There are a lot more than 40 dead in there." Mr Nek Amal, 18, was among many who gathered outside the hall seeking news of friends and family members inside. "My brother is inside and I've been trying to reach him but he is not answering the phone," Mr Amal said. "He is there with many friends of his and they're not answering their phones either." 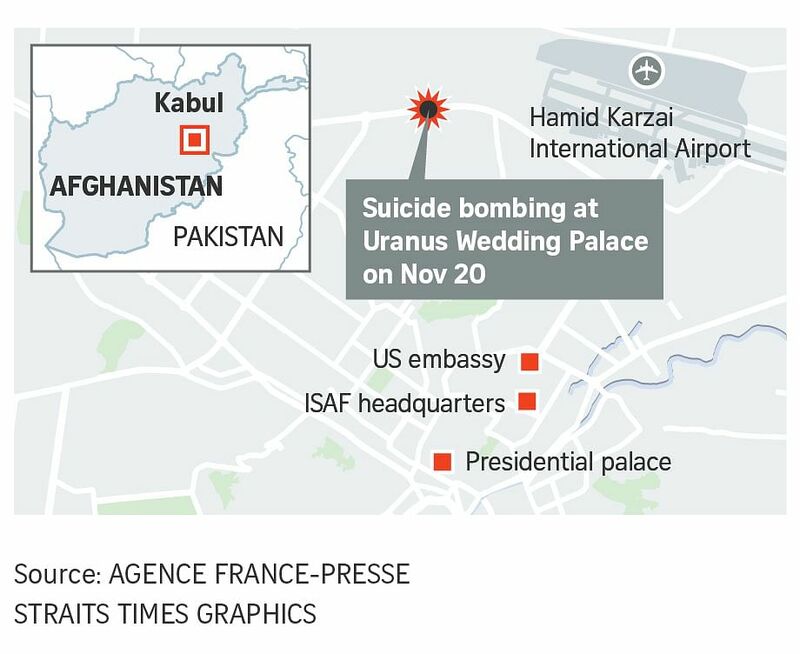 Wedding halls, mosques and religious gatherings have been particular targets of the Islamic State group in Afghanistan, but there was no immediate claim of responsibility for this attack. It was the first major bombing in the capital since an Islamic State suicide bomber struck a wrestling gym in September, killing as many as 30 wrestlers during a training session. After a period of frequent, gruesome attacks against soft targets in the capital over the summer, Afghan security forces have made it a priority to disrupt Islamic State cells in Kabul, with assistance ordered by the new commander of United States and Nato troops in the country, General Austin Scott Miller. Dozens of suspects were arrested in the capital in September on the eve of Ashura, a Shi'ite annual commemoration that has frequently been targeted. Officials believe those raids significantly lowered the number of attacks. The Taleban, still responsible for most of the escalating violence throughout the country, have disavowed attacks on civilian targets. There has been speculation that Taleban insurgents, at least, have been refraining from suicide attacks in the capital as they explore preliminary peace talks with the US government.